EdgeCookiesView displays the cookies stored by Internet Explorer and Microsoft Edge Web browser, including newer versions of Edge (starting from Fall Creators Update 1709 of Windows 10). It also allows you to select one or more cookies and then export them to tab-delimited/csv/html file, or to a file in cookies.txt format. You can read the cookies from the current running system or from the WebCacheV01.dat database on external hard drive. How to extract: Download the ZIP package and extract to a folder of your choice. Launch EdgeCookiesView.exe. Added 'Created In' column (Client or Server). When choosing an external cookies file/folder in the 'Advanced Options' window, the path is now displayed in the window title. FirefoxDownloadsView displays the list of the latest files that you downloaded with Firefox. Useful for web developers to analyze web speeds, user behavior and help keep track of browser activity. For every download details on download URL, filename (with full path), referrer, MIME Type, file size, start/end time, duration and average download speed are all displayed. How to extract: Download the ZIP package and extract to a folder of your choice. Launch FirefoxDownloadsView.exe. When using the 'Open Selected File With' option, the 'Always use the selected program to open this kind of file' check-box is now turned off and disabled. Fixed to work with the latest versions of Firefox. Sorry if I missed the point .... but what is the point of this application? In Firefox, use CTRL-J to display this information! It's faster (and easier on resources) than starting FF and hitting Ctrl+J (for example when you're working with a different browser). juvera: good question. I tried to come up with some possible uses. VideoCacheView automatically scans the entire cache of Internet Explorer/Microsoft Edge, Mozilla-based Web browsers, Opera, Chrome-based Web browsers and finds all cached media files. It allows you to easily copy the cached audio and video files into another folder for playing/watching them in the future. For video, if you have a player that is configured to play FLV files, it also allows you to play the video directly from your browser's cache. How to extract: Download the ZIP package and extract to a folder of your choice. Launch VideoCacheView.exe. Added 'Manually Merge Selected Files' option (Ctrl+M). If you have split video files that VideoCacheView cannot detect and merge automatically, you can select all items, press Ctrl+M and then VideoCacheView will merge all selected items into one. After using the 'Manually Merge Selected Files' option, you can use the 'Copy Selected Files To...' option to generate the merged file. Be aware that the order of the merged files is determined according to the created time of every file. juvera: there's a version with install/uninstall support but the other one should be portable... should we retest? 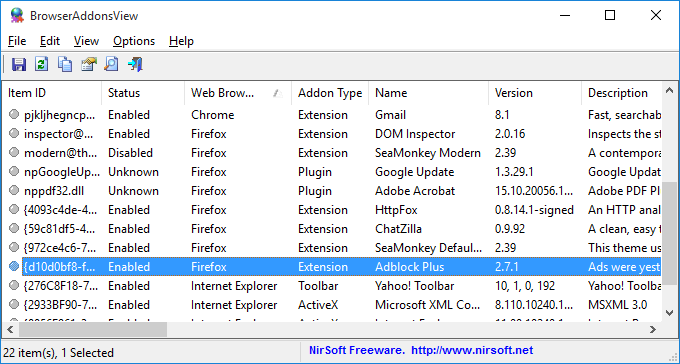 BrowserAddonsView displays the details addons/plugins installed in your system for Chrome, Firefox and Internet Explorer. If there are multiple profiles (for Chrome and Firefox), the program can detect and scan them all. How to extract: Download the ZIP package and extract to a folder of your choice. Launch BrowserAddonsView.exe. 'Add Header Line To CSV/Tab-Delimited File' option (turned on by default). /cfg command-line option to start BrowserAddonsView with the specified config file. 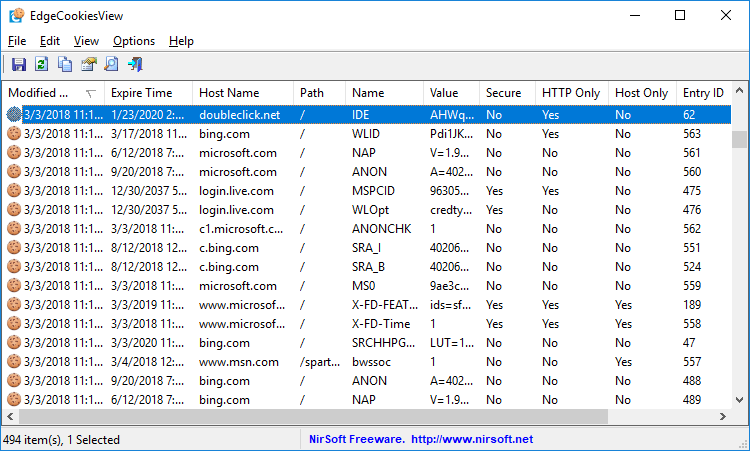 AM-DeadLink is a tool to detect dead links from URLs listed in a variety of files formats including HTML, tab and comma-separated files (CSV), and Internet Explorer, Firefox, Chrome, Opera, Vivaldi bookmarks/favorites. No idea what other changes have been made in version 4.7. The help file also doesn't include a what's new section.